There was a black (the lighting skewed how dark it really is) RPL knit, a cotton floral print, a rayonish floral, and a purple cotton blend. I can never have too much black in my stash so this was a welcome knit (eventually I may use it to try out the Bayside Romper – I especially love the mesh modification they used for the “cover”). 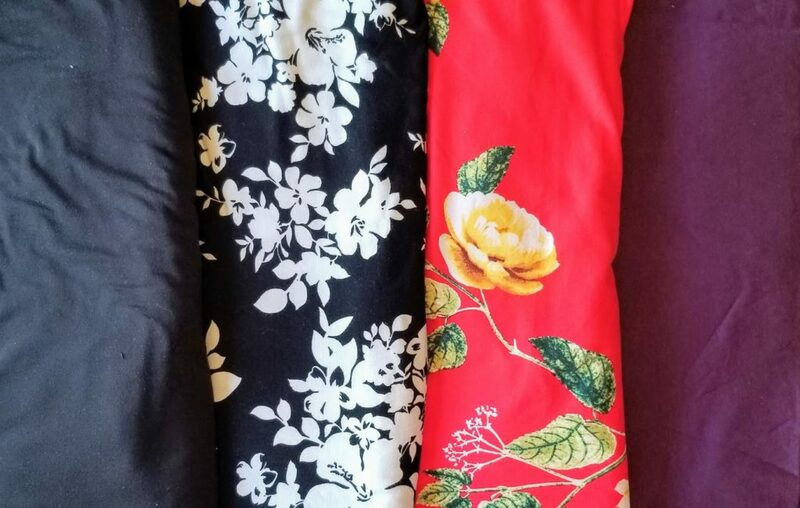 The black floral will become the South Shore Romper (because this is apparently romper season in my sewing room) while the red floral may become the Tulip Dress (I feel as if it needs to become a tropical type dress and this pattern sort of screamed “put a flower in your hair and wear me without sleeves”). As for the purple… I have no clue. It has a fall-ish hue to it so I’m not sure that I’m ready to sew it up for spring\summer… I may just use it as an accent piece to something else…. I’ll have to mull this one over! This entry was posted in Uncategorized on April 15, 2019 by stacy.